Social media is a blessing and a curse. The comparison game gets to be a little too real when you catch yourself scrolling through your feed wondering why your life isn't filled with weekend getaways to the Italian countryside and why your wardrobe is full of nothing but tank tops & t-shirts instead of threads that would make people want to shop your closet. I'll admit - there are days when I want to hurl my phone out the window and say 'sayonara' to social media for good. On the other hand, there are also days when my screen lights up with a kind message from a friend or a post from a photographer raving about their magazine template. It reminds me of what social media is all about in the first place, and that is connection. As someone who thrives on connection, Lauren Roberts knows how to draw emotion out of each photograph she takes. To say that her work gives us 'all the feels' is an understatement. Her images are a refreshing mix of all things raw and unexpected. We can't get enough! When we saw Lauren's Instagram post featuring photos of her beautiful new magazine, I felt the connection immediately to this photographer and her work. It's always such an honor to see how creatives take our designs to the next level, too. 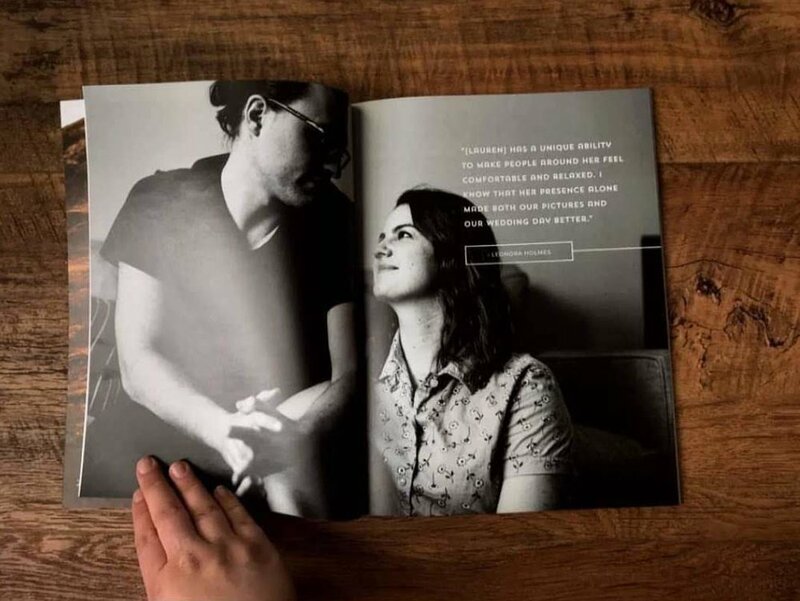 Lauren completely transformed our Elm magazine template and turned it into her own 70-page 'Matrimony Mag,' as she calls it. Is that cool, or what?! And 70 pages? That's incredible! People always ask if they're able to change the length of the magazines, and the answer is a resounding YES!! You are free to use any of the spreads multiple times (or not at all, if you don't wind up needing them). The versatility is what makes these babies so popular among photographers & other creatives, as there are literally a million different uses you can get out of each design. Unique marketing ideas for photographers. DIY branding and marketing materials for photographers. Wedding day welcome guide for photographers. Customizable wedding photography magazine guide. Customizable wedding magazine template for photographers. Magazine templates for professional photographers. "I’ve been wanting to create something for my clients that would help them plan for great light and damn good photos on their wedding day. Happy to say “The Matrimony Mag” is finally finished and has arrived in glorious print! 70+ pages of juicy goodness on everything from why engagement session are always capital F-U-N to how to look for great light in a getting ready space. Full photo spreads and tips and tricks galore on how to make the most of your wedding photos. So excited to get these in the hands of my 2018 couples!" I know you're probably wondering, "What the heck do I need a magazine for??" Well, folks, let me tell you how much of a game changer these pieces are for your business! 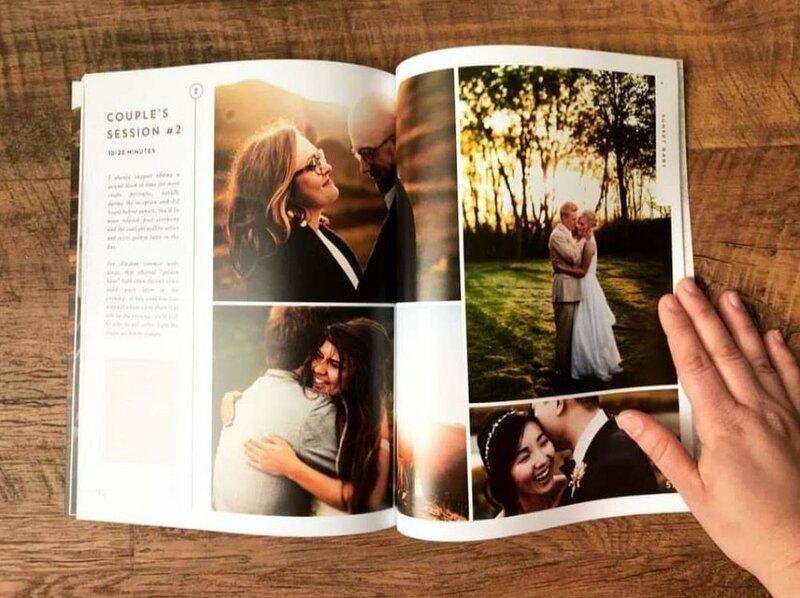 Share your collections, sample wedding day timelines, and info about your studio within a single printed (or digital) piece! Can you imagine how excited your inbox would be if it received a digital publication like this instead of a regular old text doc? I can't tell you how many messages we've received from photographers who started using our magazines and noticed a significant increase in bookings immediately after. You already have incredible images. Your website is totally rockin' it, and you feel pretty confident about your branding. These designs are the icing on the already delicious cake that gets delivered to each and every client. Those dream clients have thousands of creatives to choose from, so you might as well give them a little extra something that makes your studio unforgettable. Send clients a professionally-designed magazine with session tips, pricing, and tons of important information related to your photography business. We spent a ton of time writing the text so you don't have to. Send this magazine over to your clients as a digital guide, or print off a welcome packet to showcase your best photos. This magazine template is perfect for portrait photographers and lifestyle documentary photographers.